NASA astronauts Reid Wiseman and Steve Swanson talk to students from Elliot Ranch Elementary School in Elk Grove, California, from their home on the International Space Station during the last week of August 2014. The Americans are two of six spaceflyers on the space station representing the United States, Russia and Europe. While many Americans will spend Labor Day (Sept. 1) barbecuing, relaxing and soaking up the end of summer, U.S. astronauts in space will spend the holiday in their own way: floating in weightlessness. 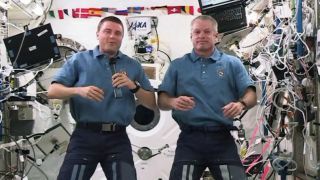 Right now, NASA astronaut Steve Swanson commands the International Space Station with fellow American Reid Wiseman serving as a flight engineer. The pair forms one-third of the space station's six-man Expedition 40 crew, with three Russian cosmonauts and European Space Agency astronaut rounding out the crew. While there is no official celebration planned, the team completed a spacewalk earlier this month and will take some well-deserved time off on Monday. On off-duty days it's common for the astronauts to send emails, work on side projects and link up via video chat with their families on the ground, Huot said. Wiseman, for example, has been a prolific photographer, posting Twitter photos of amazing auroras, as well as short Vine videos. Swanson, meanwhile, is the first astronaut to use Instagram from space. Swanson and Alexander Skvortsov and Oleg Artemyev from the Russian Space Agency are due to return to Earth on Sept. 10, while Wiseman, Maxim Suraev from the Russian Space Agency and Alexander Gerst from ESA will remain in orbit until November. Another trio of spaceflyers is waiting in Star City, Russia preparing for a Sept. 25 launch to replace Swanson, Skvortsov and Artemyev. The Expedition 40 crew is working on getting the human-like robot Robonaut 2 ready to eventually take over some of the astronauts' simple tasks inside and outside the space station. Swanson attached Robonaut 2's legs, but it still needs a few more pieces before it's able to move on its own. The crew is also monitoring ocean winds to improve weather forecasting and testing the effect of microgravity on mice. The whole station is about the length of a football field and NASA announced plans that will keep the station up and running until at least 2024.